HOUSTON -- A cardiologist who once treated former President George H.W. Bush was fatally shot by a fellow bicyclist Friday while riding through a Houston medical complex. Police were trying to determine if the shooting was random or a targeted act. It happened around 9 a.m. as Dr. Mark Hausknecht, 65, was going northbound through the Texas Medical Center, said Houston Police Executive Assistant Chief Troy Finner. "The suspect was on a bicycle as well. Rode past the doctor, turned and fired two shots. The doctor immediately went down." Hausknecht was hit at least once. He was taken to a nearby hospital where he died. He was traveling to work at Houston Methodist Hospital when he was shot, the hospital's CEO said in an email to staff. The hospital said Hausknecht was an important member of the Houston Methodist staff and the DeBakey Heart & Vascular Center, CBS Houston affiliate KHOU-TV reports. Authorities late Friday continued searching for the suspect, who was wearing a gray warm up jacket, khaki shorts and a tan baseball cap. Hausknecht treated Bush in February 2000 for an irregular heartbeat after the ex-president complained about lightheadedness while visiting Florida. 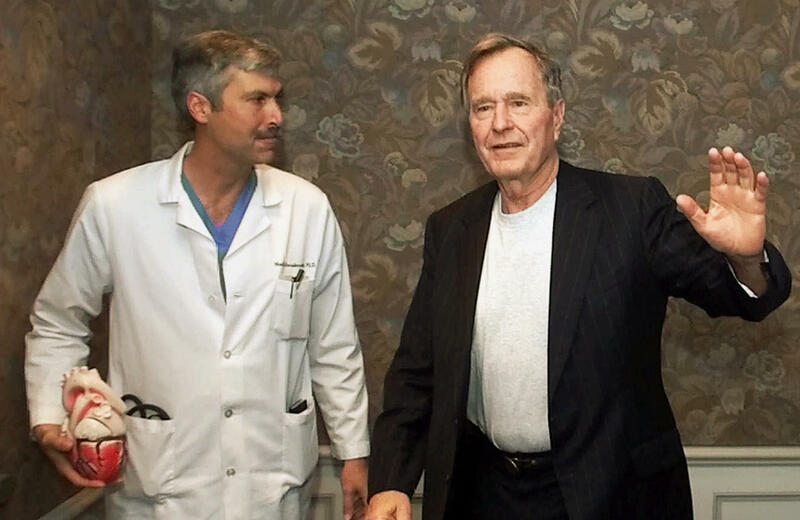 "Mark was a fantastic cardiologist and a good man," President Bush said in a statement. "I will always be grateful for his exceptional, compassionate care. His family is in our prayers."